WHITE PLAINS, N.Y. - The USTA today announced that International Tennis Federation President Francesco Ricci Bitti has been honored with the 2015 United States Tennis Association’s President’s Award. The announcement was made at the USTA Semi-Annual Meeting at the Grand Hyatt Hotel in New York City. 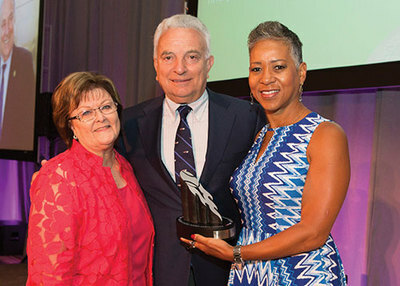 From L to R: Nancy Alfano, Chair of USTA Awards Committee; Francesco Ricci Bitti, ITF President; Katrina Adams, USTA Chairman of the Board, CEO and President. A native and resident of Faenza, Italy, Ricci Bitti has served as the president of the ITF since 1999. He will be stepping down from that position next month. A former nationally ranked tennis player, Ricci Bitti has spent his career in sports administration. He served as the president of the Italian Tennis Federation for two years before taking over as the head of the ITF in 1999. He is also currently the president of the Association of Summer Olympic International Federations (ASOIF). Ricci Bitti serves on the executive board of WADA (World Anti-Doping Agency). The President’s Award honors an individual who has given extraordinary service to the sport of tennis in the public’s interest. Since its inception in 1999, award recipients have included Billie Jean King, Lindsay Davenport, Mike Bryan and Bob Bryan and former New York City Mayor David Dinkins.